cute! :) Love the red skirt and those heels! So sweet. You guys look adorable. I love the stockings, so cute with ribbon and dots.. lol..
Love your red maryjanes!!! Merry Christmas! cute tights. anyway merry christmas! You both look so pretty ! super cute outfits. lovely blog- will definitely be visiting again soon! happy holidays+ merry christmas! aww you both are look so wonderful! 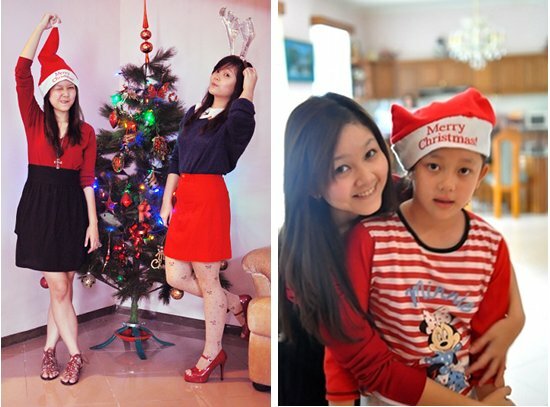 happy Christmas to you and your sister! <3 God bless you both and family abundantly! merry xmas and happy holiday! wow!! beautiful girls lovely tights merry xmas! aw I love the outfits girls! sweet smiles stevia, & sis!